Wandering Puglia: After I Pastini.... All Sorts of Reds! After visiting I Pastini and tasting Fiano Minutolo, we drove to Candido, one of the historic Apulian estates, founded in 1929. They have recently renovated their main offices, which were palatial and quite impressive. As were the wines; we began with a vertical of Duca D'Aragona, their flagship wine, and followed it with several more of their wines (accompanied by a pleasant lunch), and then tasted through the wines of a number of other producers, each of whom had brought two wines. This was one of the first times a group of Apulian winemakers had come to another winery with their wines, and from our standpoint it was a wonderful thing, because it allowed us to taste many more wines than we might otherwise have been able to. Rather than drag on, the wines. Deep almandine ruby with black reflections and almandine in the rim. The bouquet is rich, with cherry fruit supported by clean wood smoke and cedar, and some underlying balsamic notes, and hints of jammy sweetness. Quite elegant, and deft in an international key; it shows a great deal of polish and brings to mind a well-muscled athlete. On the palate it's ample and rich, with powerful red berry fruit supported by balsam-laced tannins that have a warm cedary underpinning, and flow into a fairly long warm cedar-laced tannins with lasting warmth. Quite pleasant, with tremendous finesse, and quite fresh in an international key. If you like this style you will enjoy it greatly, and even if you're more traditionally minded you will find things to ponder, because it does have quite a bit to say. Impressive. Black almandine with black reflections and almandine rim. The bouquet is very different from the 97; with powerful mentholated spice not present in the 97; there are also hints of cumin seed and coriander seed, and there is underlying red berry fruit. Interesting, in a slightly more mature key than its older relative. On the palate it's ample, with fairly rich chewy cherry fruit supported by moderate dusky acidity, and by smooth sweet tannins that have a considerable cedar overlay and flow into a warm cedar-laced finish. It's pleasant, with nice chewy tannins and rich fruit, but not quite as rich or as fresh as the 97; it is quite ready to be drunk now, and though it will age nicely for a few more years won't be as long lived as the 97. I found it more settled. Deep almandine with black reflections and almandine rim. There's more orange to it than there was in the older vintages, and this is likely the heat of the 2000 summer. The bouquet is intense, with cedar and candied fruit laced with green leather and hints of leaf tobacco; the aromas are quite pleasant, but in a more mature key than those of the older wines, and this is a characteristic of the vintage. On the palate it's bright, with lively cherry fruit supported by smoky bitter accents that are more apparent here than in the other two vintages, and flow into a clean rather bitter finish. By comparison with the other two it is a little thinner, and a bit more aggressive, and I would attribute this to the heat of the summer. Deep slightly orange ruby with black reflections and almandine rim. The bouquet is fairly rich, with jammy cherry fruit supported by some sweetness and hints of wood smoke and leather, and warm underlying cedar. Nice balance, and though it's not heatstruck it is from a hotter vintage -- not quite as tight, and less acidity. On the palate it's ample, with rich jammy berry fruit supported by tannins that have a dusky smoky burr and flow into a decidedly bitter finish with peppery accents and some berry fruit. The acidity is reduced by comparison with the older vintages, especially the 98 and 97, and the fruit has a much sweeter cast to it. In short, it is a child of the vintage, and is in a way distinct from its siblings. It is also quite young, and will develop positively for at least 5 years, but I don't think it will be as long lived as the 98, and certainly not as long lived as the 97. Pale pomegranate pink with white rim. The bouquet is bright, with lively red berry fruit supported by some sweetness, black currants, and some spice. Nice depth, and quite pleasant. On the palate it's rich, with bright slightly sour berry fruit with some underlying sweetness that flows into a clean bright berry fruit finish. Very pleasant in a seductive, rather voluptuous key, and will drink very well as an aperitif or by the glass. Expect it to go quickly. This is a Negroamaro. It's deep almandine with black reflections and almandine rim. The bouquet is fairly rich, with balsam-laced berry fruit supported by cedar and wood smoke, with the cedar becoming more pronounced as it opens. Pleasant in a rather cheeky international key. On the palate it's ample and smooth, with pleasant plum cherry fruit supported by moderate berry fruit acidity and smooth sweet tannins that have a slight cedary burr to them and flow into a warm berry fruit finish with dusky bitter tannic underpinning. Pleasant, and will drink quite well with foods, ranging from grilled meats through light stews. Expect the bottle to go quickly. 95% Negroamaro, 5% Malvasia Nera. It's black almandine with black reflections and almandine in the rim. The bouquet is fairly rich, with jammy berry fruit supported by greenish spice and some wet leather, and also nose tingling wood smoke acidity. On the palate it's ample, with moderately intense berry fruit supported by tannins that are fairly sweet but do have a dusky dry burr in the finish, and flow into a rather bitter berry fruit finish. Pleasant, and will drink better with foods than by the glass; I would be tempted to serve it with simple roasts or light stews. Pale almandine with orange rim. The bouquet is fairly rich with sweet cherry fruit supported by acidity, sugars, and iodine, and also some hopiness. Very nice, with great depth and elegance. On the palate it's full, and sweet, and a little softer than I expected, with nice berry fruit supported by a mixture of sweetness and some quinine bitterness that flows into a clean sweet finish, again tempered by hints of quinine. A nice wine one can converse with. After these wines, we continued with other wineries who had kindly brought their wines; we then bundled back into our van and drove over to the Azienda Agricola Cantele (see the photo above), where we again tasted the wines form several wineries. Since I concentrate on the wines in these situations, I didn't take as many notes as I might have liked when the producers introduced themselves, but I did take some, which are spliced in along with the wines. This is a Negroamaro. Pale pomegranate with a slightly orange cast and onionskin rim. The bouquet is fairly rich, with red berry fruit supported by slightly greenish acidity and clean spice. Refreshing. On the palate it's bright, with lively slightly greenish berry fruit supported by deft sour cherry acidity and warmth, and by tannins that have a slight greenish burr and flow into a warm rather zesty finish. Pleasant, and will work very well with foods either out doors, as a cookout or picnic wine, and with simple pasta dishes, white meats, and also ahs the acidity to work well with fried meats or vegetables, including things normally difficult to pair such as artichoke hearts. Deep pyrope with black reflections and cherry ruby rim. The bouquet is fairly rich, with jammy berry fruit supported by cedar and some hardwood ash, with underlying bitterness as well. On the palate it's ample, with fairly rich berry fruit supported by tannins that have a decidedly intense cedar overlay and flow into a long cedar-laced finish. It is, for me, a bit too heavily oaked, and I would give it a couple of years to let the oak fold in. PaoloLeo's representative says that one of Negroamaro's salient characteristics is slightly pungent peppery aromas. Mr. Minoia has conducted Valle dell'Asso since 1994. He farms organically, and also practices aridocultura -- learning to grow the vines with what water they have. A barrel sample. This is yet another Fiano, and distinct from both Fiano and Fiano Minutolo. It's pale brassy green with greenish highlights and white rim. The bouquet is still rather muted. On the palate it's bright, with lively sour lemon fruit supported by bitter lemon acidity and hints of almond that are a bit unusual. It has a slightly tired feel to it, but since it is a tank sample we will have to wait to see what it will do in bottle. This wine ages for a time in large wood. It's deep black almandine with black reflections and almandine in the rim. The bouquet is dusky, with balsamic notes and wood smoke mingled with berry fruit and some hazelnut; there's something smoky to it, and also a distance. On the palate it's ample and quite smooth, with fairly rich cherry fruit supported by moderate berry fruit acidity, and by tannins that have distinctly chocolaty cold coffee overtones derived from wood, and flow into a fairly warm fruit laced tannic finish with again quite a bit of influence from wood. If you like the style, which is rather oaky, it will work well with grilled meats or light stews. 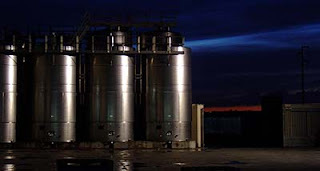 This is a large winery, with 670 hectares of land, and 170 hectares of vineyards. The estate is divided into three tenute, which are located around Brindisi. Deep almandine with black reflections and almandine rim tending towards orange. The bouquet is fresh, with lively sour cherry fruit supported by berry fruit acidity and some jammy accents supported by bright acidity and hints of lactic acid (just hints). Quite fresh, and pleasant to sniff. On the palate it's bright, with lively sour cherry fruit supported by dusky brambly bitterness and smoky acidity, while the tannins are bright and smooth, flowing into a clean bitter finish that continues at length. Pleasant, and will drink quite well with grilled meats or light stews, and also has the acidity necessary to work well with fried meats or vegetables. This is a cru, and it's the first vintage. 70% Negroamaro, and 30% Susumaniello, a traditional varietal that was present in the vineyards -- planted in rows in the vineyard to be blended into the wine. It's lively almandine with black reflections and almandine rim paling to orange. The bouquet is fairly rich, with jammy berry fruit supported by warmth and cedar, with a fair amount of nose tingling acidity as well. On the palate it's ample, with fairly rich cherry plum fruit supported by lively plum acidity, and by tannins that are still quite young, and need time to fold their oaky component into the wine. The finish is pleasant, with plum accents and nice smooth tannins; it does need another year or two for the tnnins to completely smooth. It will be worth waiting for, and future vintages should be interesting. On our last night we tasted two vintages of Agricola Vallone's most renowned wine, Graticciaia. This is a Negroamaro in Purezza, and we had the current vintage, the 2004, followed by the 1998 vintage. They are very different; in part due to the arrival of a new winemaker. Deep pigeon blood ruby with ruby rim. The bouquet is rich with red berry fruit supported by spice and some cedary duskiness. It's fairly fresh, and quite elegant. On the palate it's ample and rich with clean cherry prune fruit supported by moderate sweetness, deft prune acidity, and smooth sweet tannins that flow into a clean fresh berry fruit finish. Considerable depth and elegance, and charged, with considerable fruit in a fairly approachable international key, and it is impressive, though it is clearly in mid stride. For where it's going, see the final considerations. . Deep black almandine with almandine garnet rim that becomes more orange at the nail; with respect to the 2004 the color is deeper and blacker. The bouquet is rich, with lively berry fruit supported by clean leaf tobacco, some underbrush, hints of truffles, and some licorice root greenness as well. Nice depth and acidity, and beautiful maturity; it has many more facets than the 2004. On the palate it's full and rich with beautiful sour cherry fruit supported by deftly measured sweetness, underbrush, deft slightly balsamic acidity, and graceful silky tannins that flow into a clean slightly balsamic finish with deft sour cherry underpinning. A beautiful wine, lithe and very much on its toes, graceful and blessed with extraordinary depth and richness and perfectly balanced. By comparison, the 2004 is less interesting -- it's more approachable, and almost beckoning, but is softer and a bit more settled, and I think this is due to wood use -- the wine is slightly more vanilla laced, and this is due to tannins that draw from oak rather than from grape; they do an adequate job of providing support but are not as lithe, nor as graceful as the grape tannins. Nor do I think that the 2004 will evolve as the 1998 has. It is not peaking yet, but is following a different, and (to me) less interesting path. Pale pomegranate pink with onion skin rim. The bouquet is fairly rich, with greenish accents and some red berry fruit supported by pleasant greenish acidity and peppery spice. On the palate it's fairly rich, with bright red berry fruit supported by moderate acidity -- it's not quite as bright as some, but it is old for a Rosato. It will in any case work well as an aperitif. Deep almandine with black reflections and orange in the rim. The bouquet is fairly rich, with balsamic accents mingled with prunes and jammy spice with some toasted almonds as well, and hints of vanilla -- 10% ages in barriques for a few months, while the rest ages in steel. On the palate it's ample and smooth, with rich prune cherry fruit supported by moderate bitter acidity and by smooth sweet tannins that flow into a clean fresh plum prune finish with dry tannic underpinning. Quite nice, and will drink well with simple grilled meats or light stews. Worth seeking out. This is 80% Primitivo, 20% Negroamaro. Deep almandine with black reflections and almandine rim. The bouquet is fairly rich, and quite fresh, with chalky spice and red berry fruit supported by bitterness and some lactic acid. On the palate it's quite fresh, with rich sour cherry fruit supported by deft berry fruit acidity, and by smooth sweet tannins that flow into a clean bright finish with berry fruit and dry tannic underpinning. It's quite deft, and will drink very well with foods, an excellent reminder that just because a vintage has a bad reputation -- and the 2002 does -- the wines from it are not necessarily bad. Quite the contrary, they can be surprisingly good. This is an Antinori estate. Deep pigeon blood ruby with cherry rim. The bouquet is fairly rich, with cherry fruit supported by bright berry fruit acidity and by pleasant floral accents. Quite fresh. On the palate it's ample and smooth, with bright berry fruit supported by smooth sweet tannins that do have a dusky burr in the finish, which is bitter and fruit laced. The Italian word that comes to mind is ammiccante; it's a very approachable wine that gives one a come-hither look, and though it doesn't stand out as Pugliese -- it has more of an Antinori imprint to it than a local imprint -- it will drink quite well with foods, and if you like this sort of fairly rich fruit driven wine you will enjoy it. Deep pigeon blood ruby with black reflections and some orange in the rim. Quite charged. The bouquet is dusky, with smoky accents a fair amount of graphite bitterness with some leafy underbrush as well. On the palate it's seductive, and ample with fairly rich cherry plum fruit supported by smooth sweet tannins that have a warm cedary vanilla overlay and flow into a decidedly oaky finish with considerable tongue drying cedar and lasting warmth. It's pleasant in a very international key, but needs another couple of years for all the various pieces to come together. This is a Susumaniello in purezza. It's impenetrable pyrope with cherry ruby rim. Poured ink. The bouquet is interesting, with prune cherry fruit that has some greenish accents and an underlying sweetness; with swishing underbrush also emerges and so does some wood smoke. Quite a bit going on. On the palate it's ample, with rich cherry plum fruit supported by smooth sweet tannins that have a slight vanilla burr to it, and flow into a clean bright berry fruit finish with -- again -- some cedar that continues at length. Pleasant, and more of a food wine than a wine to be sipped. Also a wine that will age nicely for 5-8 years or more. Note: Susamaniello was an interesting discovery; it is a varietal that is probably Dalmatian in origin, and owes its name to the fact that in youth the vines produce considerable fruit, loading themselves up like donkeys -- "susumaniello" in Pugliese. The grapes are medium-sized, quite dark, and ripen in September, producing wines that develop interesting flavor and aroma profiles with time. The varietal is being reevaluated, and garnering considerable interest, both for use in purezza and as a blending varietal. Rubino, according to an online source, ahs 20 hectares under vine. Deep black cherry ruby with black reflections and cherry rim. The bouquet is intriguing, with deft floral accents that bring Aleatico to mind, mingled with cherry fruit and some greenish spice. Quite a bit going on. On the palate it's bright, and rich, with lively cherry fruit supported by brisk berry fruit acidity that has a slight greenish cast, and by smooth sweet tannins that are relatively light, and flow into a clean prune plum finish with cherry accents, and some acidity. Pleasant, in a graceful, willowy key, and it's very deft on its toes, a wine that will work well with hearty pasta dishes, thick soups, and quickly grilled meats or light stews. Very bright, and enjoyable; Worth seeking out. If you like this lighter, defter style. This is a blend of Negroamaro and Montepulciano. It's deep brick ruby with black reflections and almandine in the rim. The bouquet is moderately intense, with red berry fruit supported by wood smoke and underbrush, and a fair amount of cedar as well. On the palate it's ample and rather soft, with moderately intense plum prune fruit supported by moderate acidity, and by tannins that have a distinctly cedar-laced cast, and vanilla as well, and flow into a clean vanilla laced finish. It's heavily oaked, but has absorbed the oak well, and if you like this style you will enjoy it. A big wine, and one that will work well with foods. There's also some residual jammy sweetness to the fruit, plum jam. Deep almandine with black reflections and almandine rim. The bouquet is smoky, with a fair amount of cedar and some sweetish accents, but not much fruit. On the palate it's ample and fairly sweet, with cherry plum fruit supported by jammy sweetness and moderate acidity, while the tannins are quite smooth, with a vanilla overlay that carries into the finish, which becomes a bit tarter with some smoky accents. Like the Divoto, it has been fed a load of oak, but has digested it better, and if you like well oaked wines you will like it. If you prefer wines that are more fruit driven, it's not going to work as well for you. This is a Fiano related to the Cambpanian Fiani. It's brassy golden green with brassy reflections and brilliant greenish highlights. The bouquet is rich, with lemony citric accents mingled with hints of gunflint and deft acidity. Bracing and quite zesty. On the palate it's bright, with rich honeydew melon laced with greenish accents and supported by bright, zesty citric acidity that's more towards lime than lemon, and flows into a long warm citric finish with pleasing greenish peppery accents, and some greenish tannic notes as well. Quite pleasant, and will drink well as an aperitif or with rich fish dishes, including fried fish, and will also work well with fried meats and vegetables. It will age nicely for 3-5 years, and will be perfect in summer months. It spends time on the lees, which add further complexity as well. Deep pyrope with black reflections and cherry ruby rim. The bouquet is rich, with dusky underbrush laced with berry fruit and clean cedar, supported by some bitter graphite shavings and spice. On the palate it's full, with rich cherry plum fruit supported by lively berry fruit acidity, and by smooth sweet tannins that flow into a clean bright acidic finish. Deft, with a nice balance between wood, acidity, and fruit, and will drink quite well with foods, ranging from grilled meats and light stews, and will also age nicely for 3-5 years. Anything but settled, and quite enjoyable; though the small oak is evident, you will enjoy it even if you're more traditionally minded. The DOC says the wine must be 80% Negroamaro, and now people are shifting to considerably higher percentages if not leaving out the Malvasia Nera that was once added, directly in the vineyard, entirely. The wine is deep pyrope with black reflections and cherry rim. The bouquet is rich, with prune cherry fruit supported by greenish accents, some underbrush, and decidedly jammy overtones -- prune jam; with more swishing some dusky graphite shavings also emerge. On the palate it's ample and rich, with jammy plum prune fruit supported by smoky acidity and clean rather bitter tannins that flow into a clean fruit laced finish. Pleasant, and will drink very well with red meats or light stews, and will also age nicely for 3-5 years. Nice fruit, and quite approachable. Negroamaro produces large bunches and large grapes within the bunches, which are quite compact. Some Negroamaro vines produce smaller bunches with more loosely packed grapes, but at Cantele they are just beginning to study it. This is Negroamaro, some from Alberello vineyards and some from vineyards that are not. It's poured pyrope ink with cherry ruby rim. The bouquet is muted at first swish, though more swishing brings up prune fruit supported by delicate floral accents and some vegetal notes, with some underlying graphite shavings. Much more concentration. On the palate it's ample, with rich cherry plum fruit supported by clean deft berry fruit acidity, and by tannins that are warm and have a deft cedar laced burr with lasting warmth, and flow into a long warm peppery finish. It's quite nice, though very young, and needs another year or two to get its bearings. It will work quite well with grilled meats or stews, including stewed game, and will age well for 8-10 years. It needs time, because the oak is fairly intense. This is a blend of 60% Primitivo and 40% Negroamaro; it's inky pyrope with black reflections and cherry ruby rim. The bouquet is fairly rich, with plum cherry fruit supported by some underbrush, and by a fair amount of cedar and savory accents. Quite a bit of oak. On the palate it's ample, with fairly rich prune fruit supported by fairly bright acidity and by tannins that have a distinct oaky finish. It's pleasant, but needs time to absorb the oak it has been fed. Nice fruit, but the oak is a bit overpowering right now. They have 15 hectares of vineyards, and founded the winery to keep the Alberello vineyards their fathers had tended (sending the grapes to the cooperatives) from being abandoned. Alas, their neighbors want to replace their crops with photovoltaic panels and produce electricity. Deep black almandine with black reflections and almandine rim. The bouquet is intense, with prune fruit mingled with green leather and spice, and a fair amount of peppery spice and cedar; the grapes are dried for a month before pressing, and this concentrates and develops the aromas, which bring to mind some wines of the Veneto; as it opens interesting almond accents and jammy sweetness emerge. On the palate it's ample, with sweet prune fruit supported by smooth sweet tannins and moderate acidity that flow into a clean velvety finish. It's rich, fruity, and very smooth, and if you like this style you will enjoy it very much. It's not for everyone, but it will find its aficionados. Impressive, if you like the style. Deep black almandine with black reflections and almandine rim. The bouquet is powerful, and fairly pungent, with smoke and penetrating accents at the outset, and as it opens reveals jammy prune fruit. Quite a bit going on. On the palate it's full, with rich prune fruit supported by fairly bright prune acidity and by smooth sweet tannins that that flow into a clean jammy berry fruit finish. It's interesting, and though very extracted and quite ripe, not too overripe, and is pleasant to drink. An interesting expression of the wine, and particular too; it is a wine you will either like or not. But if you do it has quite a bit to say. This is fermented in steel, and sees no wood; it is left with slightly higher residual sugar. Violet with black reflections and cherry rim. The bouquet is powerful, with jammy plum cherry fruit supported by moderate acidity. Pleasant, and approachable. On the palate it's rich, with fairly sweet, jammy raspberry fruit supported by moderate acidity, and by smooth sweet tannins that do have a slight burr, and flow into a fairly sweet jammy finish. There are residual sugars, which make the wine very approachable, and will work for introducing those who prefer sweeter wines. More "sophisticated" wine lovers will likely prefer a drier wine, but if you like the style you will enjoy it very much; it's easy to drink and quite versatile too. This is 95% Negroamaro, and some Malvasia Nera, and is aged in tonneaux. Impenetrable pyrope with cherry rim. The bouquet is fairly intense, with smoky underbrush and prune cherry fruit supported by cloves and some balsamic notes, with underlying sweetness and slight prune jam accents. On the palate it's ample, with fairly rich prune berry fruit supported by moderate leafy acidity and smooth sweet tannins that flow into a fairly sweet prune finish with spicy overtones, more from grape than wood -- nutmeg and some clove. It's approachable in a rather old style, but has a rather tired feel to it. 20% of this wine spends a few months in barriques; the remainder is in steel. Deep pyrope with black reflections and cherry rim. The bouquet is intense, and jammy, with prune plum fruit supported by floral accents and some spice, and some cedar. Quite fresh. On the palate it's ample and quite rich, with plum cherry fruit supported by moderate prune acidity that is sufficient to provide direction, and by smooth sweet tannins that do have a slight cedar overlay and flow into a fairly long fairly sweet prune finish. Pleasant in a decidedly fruit driven soft key, and if you like the style you will enjoy it. If you prefer tighter, more nervous wines it won't work as well for you, but if you like the style it is pleasant, and will work well with drier meats. This is from grapes raised in Alberello, and spends a year in barriques. It's impenetrable pyrope with barely visible black reflections and brick rim. The bouquet is muted, though swishing brings up wood smoke acidity, savory accents, and the inside of a pumpkin (one writes what one smells). Decidedly savory. On the palate it's ample, with rich prune fruit supported by spicy tannins with peppery accents that flow into a clean cedar laced peppery finish with prune underpinning that's fairly dry. The wood has a powerful influence upon the wine, but it is pleasant in a big, opulent fruit driven key, and if you like this large rather soft style you will enjoy it. In a year or two it will work well as a sipping wine if you like the style. Negroamaro and 15-20% Malvasia Nera; it's deep cherry ruby with black reflections and cherry rim. The bouquet is fresh, with prune berry fruit and some nutmeg mingled with prunes and deft acidity that is fairly bright, and some smoky underbrush. On the palate it's bright, with lively red berry fruit supported by bright berry fruit acidity and by smooth sweet tannins that have a slight burr, and flow into a clean fresh fairly tart finish. It's quite drinkable, and will drink very well with succulent red meats or light stews; with respect to many of the other Salice Salentino wines we have tastes the grapes are not less ripe, but not overripe, and this is a very refreshing change. It's quite pleasant, and well worth seeking out. One of those wines one hates to pour out at a tasting. This is a cru that with a delayed harvest from a Negroamaro vineyard with 80 year old vines. It does spend 12-14 months in barriques, and is aged in tanks for a time too. It's inky pyrope with almandine rim. The bouquet is powerful, with rich prune cherry fruit supported by nutmeg and cloves, and also some cedar. Very complex, and still very young; one wouldn't think that it is from a very hot vintage. On the palate it's full, and rich, with bright sour cherry fruit supported by deft berry fruit acidity, and by smooth sweet tannins with lasting warmth that flow into a long warm berry fruit finish. Most impressive, and a wine that's well worth seeking out. Even if you like more traditional wines, you will like this, because it has a great deal to say. This spends three months on barriques; it's inky pyrope with black reflections and cherry rim. The bouquet is fairly rich, with prune fruit supported by jammy sweetness and some greenish accents. Supported by a fair amount of alcohol, which imparts further sweetness. On the palate it's ample and quite sweet, with fairly rich prune fruit supported by smooth sweet tannins that flow into a warm prune finish with dusky tannic underpinning. It's quite ripe, but pleasant in a big soft fruit driven key, and if you like the style you will enjoy it. This is a blend of Negroamaro and Malvasia Nera, and is impenetrable pyrope with cherry ruby rim. The bouquet is fairly intense, with quite a bit of alcohol and some jammy fruit supported by some cedar and hints of leafy underbrush. Quite concentrated. On the palate it's ample and sweet, with full sweet prune fruit supported by moderately intense prune acidity that has some nutmeg overtones, and flows into a fairly rich berry fruit finish. It's very big, very soft, and rather sweet; if you like the style you will enjoy it, but you have to like the style. Because of the softness of the wine, I would drink it with drier meats. Impenetrable pyrope with black cherry reflections and cherry rim. The wine spends a few months in steel, but no wood. The bouquet is fairly intense, with prune fruit supported by some animal notes -- it brings a sweaty blonde to mind -- and there are also mentholated notes as it opens. On the palate it's full and fairly sweet, with prune fruit supported by clean berry fruit acidity and by smooth sweet tannins that flow into a clean bright berry fruit finish. It's pleasant, and will drink well with drier meats; if you like bigger softer fruit driven wines you will enjoy it very much. The lack of wood is quite refreshing. This is the classic 80-20 blend of Negroamaro and Malvasia Nera. It's impenetrable pyrope with black reflections and purple rim. The bouquet is fairly rich, with wood smoke and greenish accents mingled with berry fruit and some spice. Nice depth. On the palate it's ample and smooth, with soft berry fruit supported by clean cedar laced tannins that flow into a fairly rich plum finish. It's a bit drier and less interesting than the Anima di Primitivo. This year I decided to begin with the 2004 Brunello di Montalcino Riserva, and then do a sprinkling of 2005 Brunello, for a couple of reasons. First, the 2004 vintage was interesting, both because Nature smiled brightly in some areas (alas, less so in others), and because it came on the heels of the Brunello scandal -- in the 2004 vintage I had noted a distinct change in the color and character of some winery's wines with respect to older vintages. Put simply, they were much more what one would expect of Sangiovese, in terms of color, aroma and tannin structure. So I wanted to see if Nature's bounty carried through into the Riserve, and if the trends I had observed last year still held. In terms of vintage quality, the 2004 Brunello di Montalcino Riserva echoed the 2004 Brunello di Montalcino, and this really comes as no surprise. Some of the wines are stronger than others, and this requires that one approach them with care, and, if one is buying bottles to set aside (and there are many that warrant it) one should taste first. In terms of color and character, well... A number of the Riserve were considerably darker and more concentrated than the basic 2004s, and while one might expect this considering that they are Riserve, it is also possible that there was some backsliding. Unfortunately, the 2005 vintage is not going to provide a good answer to this question (more on this below), and therefore we'll have to wait until the 2006 is released. The other reason I chose to taste through the 2004 Brunello di Montalcino Riserva was purely practical: Benvenuto Brunello is a two day event, and this year 136 wineries were presenting their wines. 136 Brunelli and a few vineyard selections is a lot of wine to work through in 2 days, especially when the wines are young, big, and tannic. By comparison there were about 70 Riserve, and in doing them all, rather than cherry-picking, I got a better idea of the vintage, and also had an opportunity to taste wineries I might not otherwise have selected. And this brings us to the 2005 vintage. 2005 was one of the cooler wetter vintages in recent memory, and while Montalcino is a bit warmer and drier than Chianti, it is still in Tuscany. Therefore the wines are cut from the same cloth as the 2005 wines from other Tuscan appellations: brambly, tart, with considerable acidity and moderate, not too ripe fruit. This is a sort of vintage that I think displays its best with brief aging, and works very well with foods, but is not necessarily going to be something one wants to sip and think about. In addition, red wines from cool wet vintages are best drunk quickly, because they are not particularly ageworthy. In short, 2005 was a much better year for Rosso di Montalcino, which is released young, than Brunello, which must by law age for 4 years prior to release. In vintages of this kind, all bets are off, and I think the most successful wines come from those who accept the hand Nature has dealt them, making wines that are lighter, and less fruity than Brunello from a more normal vintage, but display a willowy grace, and can show considerable finesse as well. Some of those who instead tried to compensate for Nature's stinginess through cellar tricks, which can include barrique use to impart tannins, or what is called the "taglio migliorativo," the addition of up to 15% of a different vintage that will (the winemaker hopes) compensate for the paucity of the primary vintage, ended up with disjointed wines, while others ended up with unusual combinations of under and overripeness, the result of bringing together two different wines (I consider distinct vintages to be distinct wines in this case) who really don't know what to do with each other and manage to stay distinct even as they share space in a bottle. You might conclude from the above paragraph that you should simply avoid the 2005 Brunello di Montalcino. And you would be wrong, because the winemakers who worked well produced wines that are quite graceful. But you will have to select with care, and keep in mind that some of the winemakers who are normally a sure bet are among those who tried hardest (perhaps because they usually are a sure bet) to compensate for Nature's stinginess. Therefore, talk to the people in your wine shop, and if you are buying a case for a special occasion or to set aside to celebrate a recurrence, taste before you buy. And this is why I think we will have to wait until next year to see if the colors and aromas of the 2004 Brunello di Montalcino represent a true change of course and not a bump in the road: Many 2005s display darker colors and richer aromas that are either the result of more intense oak than usual, or the addition of powerful ripe older vintages (e.g. 2003), and are therefore not really typical of Brunello. 2006 should give a much better indication, because it was a much better vintage that will not require these sorts of corrective measures. Brick almandine with black reflections and almandine rim. The bouquet is vinous, and elegant, with rich cherry fruit supported by slight dusky greenish accents and clean spice, together with quite a bit of alcohol. A big wine that is at the beginning of a long journey. On the palate it's ample and rich, with fairly intense berry fruit supported by moderate acidity, which is more mineral than fruit driven, and by smooth sweet tannins that flow into a clean bitter finish. It's graceful, but very young, and needs another 3-5 years to really get its bearings. This said, the tannins are already smooth enough that one might enjoy it with a steak. Brick almandine with black reflections and almandine rim. The bouquet is fairly intense, and more mature than some of the others, with dusky berry fruit supported by balsamic accents and clean cedar; the overall impression is quite harmonious, and with time mentholated accents also emerge. On the palate it's ample and very smooth, with fairly rich cherry fruit supported by dusky cherry acidity and by smooth sweet tannins that are already becoming silky, and flow into a long clean bitter finish with tannic warmth and some sour berry fruit. Pleasant, and quite mature; if I didn't know the vintage I might have guessed older. It will drink well with grilled meats, hearty roasts, and substantial stews, for example boar with polenta, and is worth seeking out. Almandine with black reflections and almandine rim. The bouquet is deft, with floral accents and vinous notes mingled with pleasant cherry fruit and some berry fruit acodoty with some underbrush as well. On the palate it's full, with elegant cherry fruit supported by clean slightly brambly savory acidity, and by smooth sweet tannins that flow into a clean deft berry fruit finish. It's quite approachable, in a fairly delicate key, and will already drink well with roasts or stews, though it also has the legs to age well for many years. One of the 2005s that best impressed me. Brownish almandine with black reflections and almandine rim. The bouquet is quite traditional, with saddle leather and some savory accents mingled with hints of eucalyptus. Not much fruit, but it is graceful. On the palate it's ample and quite smooth, with moderately intense leathery fruit supported by warm mineral acidity and very smooth tannins that flow into a clean leathery finish. It seems much older than it is, and the acidity is oddly lacking; what there is mineral, and harmonious, but it's lesser key and as a result the wine seems fairly flat. A pity, because the nose was elegant. This said, if you like the style you will like it. Deep black almandine with black reflections and almandine rim. The bouquet is moderately rich -- not quite muted, but not open either -- with dusky berry fruit supported by cheeky sour cherry acidity and by some spice, with hints of cedar as well. It's still developing. On the palate it's ample and smooth, with moderately intense fairly mineral berry fruit supported by mineral acidity and silky smooth tannins that flow into a long savory finish with berry fruit underpinning. It's not as rich as I might have expected, and though there is acidity it's not as perky as I would expect a young Brunello to be. Elegant, but slightly settled on its laurels. Deep black almandine with black reflections and almandine rim. The bouquet is young, with rich fruit supported by clean spice and slightly mineral acidity with an underlying pungency as well. On the palate it's full, with fresh lively cherry fruit supported by deft berry fruit acidity and by smooth sweet tannins that flow into a clean bright berry fruit finish. Pleasant in a cheeky sort of way that brings to mind a smiling teen; it's very young but already drinkable, and will work very well with grilled meats or a roast if you feel you must open it. But if you have patience, it will do beautiful things with time, and still be climbing in 10 years. Lively almandine with black reflections and almandine rim. The bouquet is fairly rich, with deft cherry fruit supported by spice and alcohol, and also by some cedar. Airy, and gives an impression or being ready to drink. On the palate it's ample and rich, with powerful cherry fruit supported by deft acidity and smooth sweet tannins that flow into a clean bright berry fruit finish that gains definition from lasting acidity and smooth tannic underpinning. Quick to write, but harmonious and quite pleasant to drink; will also age well for many years. Black almandine with black reflections and almandine rim. Looks quite charged. The bouquet is powerful, and strongly wood laced, with cedar and vanilla mingled with alcohol and minerality, and some pungency, but not much fruit. On the palate it's ample and soft, with moderately intense plum fruit supported by moderate acidity, and by tannins that are very smooth. There's something cavernous to it; it brings to mind a great open space that is also rather dark. I would have liked more depth and freshness. Ripe ripe fruit is good, when it has the acidity to support it, but there isn't enough here. Deep black almandine with black reflections and an orange almandine rim. The bouquet is intense, and young, with cherry fruit supported by some vegetal acidity and by delicate cedar that nicely balances the fruit. Harmonious, though very young, and is still falling into place. On the palate it's ample, with fairly rich ripe cherry plum fruit supported by dusky berry fruit acidity and by smooth sweet tannins that flow into a fairly long prune finish with cedary tannic underpinning. It's elegant, in a quite ripe fairly international key, and if you like the style you will enjoy it, though I would give it another year or two to get its bearings. If you prefer brighter acidity, and fruit that's redder it won't work as well for you. Deep black brick ruby with back reflections and pale almandine rim. The bouquet is intense and brooding, with quite a bit of alcohol supported by greenish mentholated accents and moderately intense cherry fruit. It's in mid stride, but already has quite a bit to say. On the palate it's ample and rich, with lively sour cherry fruit supported by brisk mineral cherry acidity, and by tannins that have a warm splintery burr and flow into a clean bright berry fruit finish with tannic underpinning. It's pleasant, but very young, and will benefit from another year or two in bottle; expect it to age well for 10-15 years. If you like the style, which is middle of the road, it's worth seeking out. Deep black almandine with black reflections and almandine rim. The bouquet is dusky, with greenish accents and some pungent balsamic acidity, supported by slight barnyard tang. A bit rustic, but does have quite a bit to say. On the palate it's ample, with fairly rich sour cherry fruit supported by deft berry fruit acidity and by tannins that gain definition from a slightly greenish burr, and flow into a warm sour berry fruit finish. Graceful, and will drink very well with foods, in particular roasts and grilled meats of the elegant variety, such as a porterhouse steak, and will also age well for many years. Deep black almandine with black reflections and almandine rim. The bouquet is dusky, with smoky hardwood ash mingled with balsamic accents and some penetrating spice; there's also some cherry fruit. On the palate it's ample and smooth, with fairly rich cherry fruit supported by smooth sweet tannins and by fairly bright acidity that flow into a rather blocky tannic finish. It's still very young, and needs another couple of years to get its bearings and for the nose to develop. At present the oak is quite evident, especially on the nose, but the fruit and acidity are sufficient to counter it on the palate, and with time it will fold in. I expect it to go places, but the score reflects where it is now. Deep black almandine with back reflections and almandine rim. The bouquet is intense, with vinous notes and dusky graphite shaving bitterness mingled with red berry fruit and some spice, and, as it opens -- it's quite closed -- berry fruit acidity and some minty jammy accents. On the palate it's ample and rich, with powerful cherry fruit supported by moderate sour cherry acidity that gradually emerges to provide warmth, and by smooth sweet tannins that flow into a long clean berry fruit finish. Graceful, and will drink very well with foods, in a slightly less aggressive key; the tannins are there and support, and the acidity directs, but there's nothing brash nor overly bright about it. If you like the style it is quite elegant, and will drink nicely with red meats or stews in the short term, and also age nicely for a decade or more. Dusky almandine with black reflections and almandine rim. The bouquet is shut tight, though swishing brings up some dusky brambly accents with underbrush as well. On the palate it's fairly full, with ripe cherry fruit supported by smooth moderately intense acidity that has a brambly cast, and by splintery tannins that flow into a rather tannic finish. It's a bit of a disappointment; the palate is fruity but comes across as a bit thin, and while this is in part youth it's also the wine. Deep black almandine with black reflections and almandine rim. The bouquet is closed, and swishing brings up just a bit of cedar, and some airy spice. Not much fruit. On the palate it's fairly rich, with bright cherry fruit supported by deft berry fruit acidity, and by smooth tannins that have a slight savory burr and flow into a clean fairly bright sour cherry finish. The nose is lagging behind the palate, and I would give it at least a couple of years to catch up, at which point it will be graceful, and also age well for many years thereafter. In short, it's a work in progress now, but one that will be quite nice when it's finished. Impenetrable almandine with black reflections and lam rim. The bouquet is fairly intense, with an initial rush of shellac mingled with spice and some red berry fruit. Not much in the way of acidity, and it seems rather ripe. On the palate it's ample and soft, with moderately intense berry fruit supported by rather slight acidity, and by tannins that have a greenish cedary overlay and flow into a clean greenish finish. I'd have liked more brightness overtones the fruit, and greater depth to the wine. Deep black almandine with black reflections and almandine rim. The bouquet is moderately intense; there's spice, mingled with cedar and some greenish notes, but not much fruit, and it's not as clean as it might be. On the palate it's ample and soft, with fairly rich cherry plum fruit supported by brisk acidity and sweet tannins that flow into a sour finish. It's again not as clean as I might have liked, and this is a pity because I rather liked the 2004 Brunello Base I tasted last year. Impenetrable pigeon blood ruby with barely visible black reflections and cherry rim. Looks younger than it is, and also concentrated. The bouquet is powerful, with hardwood ash and some balsamic accents, but not much fruit; there's also quite a bit of alcohol and as it opens some dried mushrooms also emerge. On the palate it's ample, with moderately intense cherry plum fruit supported by smooth sweet tannins and by fairly bright cherry acidity. The nose is behind the palate by at least a year, and it needs several more to really come into its own. It will, I think, be worth waiting for, because at present the nose is in hiding. Lively almandine with black reflections and almandine rim. The bouquet is fairly bright, with cherry and forest berry fruit supported by greenish mentholated acidity and by warm spice, with some slight balsamic notes as well. A bit up in the air, but pleasant. On the palate it's ample, and rather soft, with bright sour cherry fruit supported by sour berry fruit acidity and by smooth sweet tannins that flow into a clean bright finish. Pleasant in a rather light key, and while this is in keeping with the vintage, it's in some ways more like a Chianti than a Brunello, This said, it is quite pleasant to drink, and will work nicely with grilled meats or roasts, and also has the capacity to age well for a number of years. Though it is ready now. Deep black almandine with black reflections and almandine rim. The bouquet is fairly rich, with red berry fruit supported by spice and slight greenish accents, with underlying cedar. Nice balance in a youthful key. On the palate it's ample and fairly soft, with moderately intense berry fruit and moderate acidity, supported by smooth sweet tannins that have a slight peppery cedar laced burr that flow into a warm spicy finish. It's in mid stride, and has yet to digest the wood that kept it. It will develop nicely over the next couple of years, and age well for a decade or more, becoming lacy with time. Delicate almandine with black reflections and almandine rim. The bouquet is elegant, with ripe cherry plum fruit mingled with mentholated spice and hints of underbrush and leaf tobacco with some cedary underpinning too. Quite young. On the palate it's full, with fairly rich bright cherry plum fruit supported by lively sour berry fruit acidity and by smooth tannins that have a warm burr and flow into a clean fresh berry fruit finish. Graceful in a lesser vintage, somewhat slighter key, and will drink well with foods now though it also has the potential to age well for a number of years. Deep black almandine with black reflections and almandine rim. The bouquet is muted, though swishing brings up some vegetal accents mingled with graphite and candied cherries, and quite a bit of alcohol. It's not doing much for me. On the palate it's ample and languid, with fairly rich cherry fruit supported by smooth sweet acidity, and by tannins that are rather evanescent, flowing into a sour cherry finish. I'd have liked greater depth and definition to the tannins, which are delinquent, and don't do their duty. Deep black almandine with black reflections and almandine rim. The bouquet is muted, though swishing brings up cherry plum fruit supported by some cedar and slight saddle leather. In progress. On the palate it's ample and soft, with cherry plum fruit supported by mentholated acidity, and by smooth sweet tannins that flow into a fairly long sour cherry finish with slight peppery undertones. I'd have expected more depth, and also, at this stage, brighter acidity and (especially) tannins. Deep black almandine with black reflections and almandine rim. The bouquet is in mid stride, with leaf tobacco mingled with spice and a fair amount of alcohol, and also as it opens jammy plum fruit. On the palate it's ample, and languid, with opulent plum fruit supported by moderate acidity, and by smooth sweet tannins that flow into a clean fresh plum finish. Very opulent, and quite soft in a fruit driven overripe key; it almost feels like a concentrated fruit juice, and if you like this in a wine you will like it. But it's not what I look for in a Brunello. Elegant lam with black reflections and almandine rim. The bouquet is elegant, with fairly rich cherry fruit supported by dusky graphite bitterness and some penetrating cut tobacco. Nice depth and quite young. On the palate it's graceful, with rich slightly sour cherry fruit supported by brisk berry fruit acidity, and by smooth sweet tannins that flow into a clean warm berry fruit finish that settles quickly (perhaps a little too quickly) into lasting warmth. Graceful in a cheeky sort of way, and will drink nicely with grilled meats or roasts; I would give it a year to get its bearings and expect it to age well for a decade or more. Lively black almandine with black reflections and almandine rim. The bouquet is fairly sweet, with berry fruit supported by cedar and some penetrating spice, with hints of underlying leather as well, and some ripe yellow peach; a fellow taster also notes dried prunes. It gives an impression of size. On the palate it's ample, with cherry plum fruit supported by bright slightly balsamic berry fruit acidity, and by tannins that are smooth and a bit softer than I might have liked in a young wine; it needs a year to get its bearings, and will then age nicely for a number of years. It's softer and riper than previous vintages of La Fortuna have been, and this is an effect of the vintage, I think. I would give it a year to find itself and then drink it with a steak. Lively almandine with black reflections and almandine rim. The bouquet is fairly intense, with warm balsamic accents mingled with berry fruit and some spice, also considerable alcoholic warmth. On the palate it's full, with bright rather bitter red berry fruit supported by spice and fairly rich balsamic acidity, and by smooth leathery tannins that do have a warm burr, and flow into a fairly long warm slightly balsamic finish. It's pleasant in a fairly traditional key and though one could drink it now, it will also age nicely for a number of years. Quite pleasant, and worth seeking out if you like this style. Deep black almandine with black reflections and almandine rim. The bouquet is fairly intense, with balsamic notes mingled with some greenish accents, some acidity, savory notes, and some bramble. Not much fruit. On the palate it's fairly rich, with dusky cherry fruit supported by clean savory spice and moderate acidity, while the tannins are quite smooth. The wine is surprisingly ready for a just released Brunello, and while I don't object to ready-to-drink wines I would have liked greater depth to it. It will, I fear, fade in a relatively small number of years. Impenetrable pyrope with black reflections and cherry rim. Looks younger than some. The bouquet is fairly intense, with sweet plum fruit laced with graphite and savory pungency. It seems quite ripe, but isn't expressing itself well. On the palate it's ample and fairly sweet, with cherry plum fruit supported by dusky cherry acidity, and by tannins that have a greenish vegetal burr and flow into a fairly long bitter finish. The grapes must have been exceedingly ripe when they were picked, and the wine doesn't have the definition nor the tightness I would have liked. If you like big soft, fairly sweet wines you will enjoy it, but you have to like the style. Deep black almandine with black reflections and almandine in the rim as well. The bouquet is intense, and rather rustic, with greenish balsamic accents and warmth supported by India ink bitterness and moderate acidity; as it opens cedar also emerges, but there isn't much fruit. On the palate it's ample, and soft, with full sour cherry fruit supported by fairly bright berry fruit acidity, and by tannins that are very smooth and quickly fade, allowing acidity to carry into a long tart finish. It's languid and curvy but lacking in the definition tannins with more backbone would have given. Deep black almandine with black reflections and almandine rim. The bouquet is powerful, with sour berry fruit supported by haunting greenish accents -- almost green peach skin fuzz -- and a fair amount of warmth; as it opens sweeter notes also emerge. On the palate it's full, with fairly rich, rather sweet cherry fruit that has some plum accents, and is supported by clean berry fruit acidity and smooth tannins that have a slight burr, but aren't really aggressive, and flow into a clean sour cherry finish. It's pleasant in a cheeky middle of the road key, and will drink nicely with stews or roasts in the short term, and also has the capacity to age for a decade or more. Deep black almandine with black reflections and cherry rim. The bouquet is moderately intense, and a bit earthy, with wet clay mingled with bramble and underbrush, and some alcohol, and underlying it all rather shy greenish berry fruit. On the palate it's ample, with fairly bright sour cherry fruit supported by moderate acidity and by tannins that have a warm balsamic overlay and flow into a peppery greenish finish. A classic cool weather wine, and a pleasant expression of the vintage; it's about ready and will drink well with grilled meats or light stews, though it also has the capacity to age for up to 10 years. Deep black almandine with black reflections and almandine rim. The bouquet is rustic and penetrating, with considerable animal tang mingled with balsamic acidity and hints of shoe polish. On the palate it's ample and soft, but bright, with lively cherry plum fruit supported by bright acidity and by smooth sweet tannins that are lighter than I expected, and flow into a plum cherry finish that settles into acidic warmth. It's ample and soft, but not as ripe as wines this ample and soft are, and if you like big sweet wines that have a red berry cast rather than prune, you might want to consider it. Deep black cherry ruby with black reflections and cherry rim. The bouquet is fairly rich, with red berry fruit supported by greenish mentholated accents and jammy sweetness, with a fair amount of alcohol and some cedar as well. On the palate it's full, with fairly rich, ripe plum cherry fruit with some sweet accents supported by moderately intense acidity, and by tannins that have an angry peppery purr and flow into a hot tannic finish with underlying plum that must be fairly intense to make it out from under the tannins. It's still very, very young, and the tannins need at least another year to round and smooth, at which point it will drink well with stews or roasts, and be something to consider if you like fairly lush very ripe wines. Because the grapes were quite ripe, and this translates into both the sweetness and the prune accents of the fruit. Deep black almandine with black reflections and almandine rim. The bouquet is eye opening, with greenish accents mingled with spice and alcohol, and some candied fruit. Charged, and still not completely settled. On the palate it's ample and smooth with fairly rich cherry fruit supported by moderate acidity, and by tannins that lay a splintery veneer over the tongue, and flow into a fairly long tannic finish with bright acidity. It's still up in the air, and needs another year at least to get its bearings and come together. It will in any case be ample and rather soft, because tannins (in my experience) don't gain intensity with time, and is therefore a wine you should consider only if you like the larger softer end of the scale. Deep black almandine with black reflections and almandine rim. The bouquet is fairly rich, and quite ripe, with mentholated prune fruit supported by cedar and a fair amount of alcohol; it gives an impression of ripeness. On the palate it's ample, and rich, with powerful cherry fruit supported by moderately intense berry fruit acidity, and by smooth sweet tannins that aren't as broad as I might have liked, and flow into a clean dusky cherry fruit finish that settles into lasting warmth. It's ripe but not overripe, and with considerable concentration of fruit, but the tannins aren't as powerful as I might have liked, and this makes the wine less interesting than it might have been, at least for me. If you like the style it's pleasant enough, but you have to like the style. Lively almandine with black reflections and almandine rim. The bouquet is fairly rich, with greenish berry fruit supported by deft vegetal acidity and hints of more balsam than cedar; it's elegant in a youthful key. On the palate it's full, with rich rather languid cherry fruit supported by bright berry fruit acidity, and by smooth sweet tannins that flow into a clean elegant cherry fruit finish. Graceful, and will drink nicely with succulent grilled meats or roasts now, and also has the capacity to age well for 8-10 years at least. Pleasant, and if you like the style, which is fairly traditional, it's Worth seeking out. Deep black almandine with black reflections and almandine rim. The bouquet is powerful, with candied cherries mingled with menthol and some sweetness; it seems quite ripe. A ripeness confirmed on the palate; it's big and soft, with ample red berry fruit supported by moderate acidity and by blocky cedary tannins that will need at least a year to smooth, and perhaps two. It's a bit disjointed, and does need time to come together, but it will in any case be soft, with less acidity and tannic definition than I would hope for. Deep black almandine with black reflections and almandine rim. The bouquet is moderately intense, with sweetish balsamic acidity and balsam mingled with mentholated cherry fruit and supported by a fair amount of alcohol and deft spice. On the palate it's ample and soft, with fairly bright berry fruit supported by soft berry fruit acidity and by tannins that are smooth and have a slight balsamic cedar underpinning, and flow into a clean fairly rich sour berry fruit finish. It's a touch overripe, and smooth and soft, and quite approachable in a lesser vintage key. It also has the legs to age nicely for a number of years, and will do interesting things with time. In short, nice. Deep black almandine with black reflections and cherry rim. The bouquet is rich, and quite ripe, cherry and forest berry fruit supported by jammy accents and clean mentholated spice. Pleasant, and nice balance. On the palate it's full and rich, with powerful fairly sweet cherry fruit supported by deft berry fruit acidity and smooth sweet tannins that flow into a clean rather bitter finish. Quick to write, but harmonious, and will already drink well with a roast or a stew, though it's at the beginning of a long journey. Worth seeking out if you like the style, which is deft and nicely balanced, but has a little more residual sweetness than some, and is a result of the ripeness of the grapes. Deep black almandine with black reflections and cherry rim. The bouquet is muted, though swishing brings up leather and some savory accents with underlying spice and warmth. On the palate it's ample and soft, with rich cherry plum fruit that gains roundness form slight sweetness, and is supported by moderate acidity and smooth sweet tannins that are not too intense. It's a bit settled. Deep black lam with black reflections and almandine rim. The bouquet is fairly intense, with leathery berry fruit laced with pungent greenish accents. On the palate it's full, with bright rather sweet cherry fruit supported by greenish vegetal acidity and tannins that are frankly cedar-laced and flow into a warm tannic finish. It's a bit disjointed, in a very ripe key, and needs another year at least to get its bearings and decide what it wants to be. I found myself wishing it were tighter and brighter, because the fruit is rather overripe and brooding. Deep black almandine with black reflections and almandine rim. The bouquet is intense, and jammy, with quite a bit of alcohol and peppery spice mingled with cherry jam, sweetish cedar, and dried prunes. Quite ripe, and hulking; it gives an impression of sweetness too. On the palate it's ample, with powerful cherry plum fruit supported by moderately intense acidity and by tannins that are decidedly splintery and flow into a warm dry splintery tannic finish. It's developing, and needs at least a couple of years for the tannins to smooth. When they do it will be ample in a soft, ripe, but not too ripe key. If you like the style you will enjoy it, but you have to like the style. Deep black almandine with black reflections and almandine rim. The bouquet is fairly rich, with greenish accents mingled with jammy plum fruit supported by some cedar and by menthol and some graphite shavings. On the palate it's ample and sweet, with full plum fruit supported by moderate acidity and tannins that are soft and very smooth, and flow into a warm plum laced finish. Cavernous, and doesn't really work for me. Deep black almandine with black reflections and almandine rim. The bouquet is powerful, with cut tobacco bitterness mingled with underlying berry fruit and greenish accents. It's very much in mid stride. On the palate it's bright, with rich cherry fruit supported by lively berry fruit acidity, and by smooth sweet tannins that have a slightly greenish peppery spicy cast from wood, and flow into a fairly long warm finish. The palate is much more along (and presenting better than) the nose, and I would give the wine a year for the various pieces to come together and catch up with each other. If the nose follows the palate it will be pleasant in a middle of the road key. Deep black almandine with black reflections and almandine rim. The bouquet is fairly intense, with cherry fruit supported by greenish accents and some licorice and spice with a fair amount of alcohol as well. On the palate it's full, with fairly rich cherry prune fruit supported by sweetish berry fruit acidity and by smooth sweet tannins that flow into a clean berry fruit finish. Pleasant, in a ripe soft key, and if you like the style you will enjoy it. Deep black almandine with black reflections and almandine rim. The bouquet is intense, with plum prune fruit supported by spice and greenish accents supported by quite a bit of alcohol. Big wine. On the palate it's ample and fairly rich, with soft sweet sour cherry prune fruit supported by warm citric acidity and sweet tannins that have a slight burr, and flow into a warm tannic finish. It's a bit disjointed, and needs time to come together, but it will always be ample and rather soft, and is something you should only consider if you like this style. Deep black almandine with black reflections and almandine rim. The bouquet is intense, and balsamic, with warm savory acidity as well, and hints of wet stable straw. On the palate it's ample, with rich spicy cherry plum fruit supported by moderate plum acidity and by tannins that are greenish and have a warm, angry peppery burr. It's pleasant, in an ample soft key, and will drink well with foods. But you have to like the style. Within the context of this style, I liked it better than many others. Dusky almandine with brownish black reflections and almandine rim. The bouquet is fairly intense, with green leather and some balsam mingled with spice and cherry fruit that has some candied overtones. Powerful. On the palate it's ample, and fairly soft, with bright fairly sweet berry fruit supported by smooth sweet tannins and moderately intense rather balsamic acidity that flow into a clean dry rather tannic finish. It brings together a rather unusual combination of combines a degree of overripenss with a traditional cast of flavors and aromas, and is particular. I'd have liked brighter, less ripe fruit but this is my preference. black almandine with black reflections. The bouquet is closed, though swishing brings up brambles and some brambly acidity with some graphite shaving bitterness as well. On the palate it's ample, with fairly rich cherry fruit supported by brambly cherry acidity and smooth sweet tannins that flow into a brambly berry fruit finish that's fairly long. Deft, and quite elegant in a cool vintage key; it doesn't reveal strange attempts to compensate for what the vintage didn't give, and this is positive. It will drink nicely now with simple roasts or light stews, and will also age nicely fro 5-10 years, though I wouldn0't go much further. Almandine with black reflections and almandine rim. The bouquet is fairly rich, with sweet cherry jam and hints of menthol with a fair amount of alcohol on the nose, and also some delicate balsamic accents. On the palate it's ample and soft, with balsamic cherry fruit supported by warm balsamic acidity and by smooth (very smooth) tannins that flow into a balsamic slightly savory finish. If you like wines that have backbone and acidity it won't work for you, but it does display an elegant swooning grace and will be pleasant to drink in the next 5-8 years, though I don't know how long it will age beyond then. Because of its softness it's more a wine to be drunk by the glass than a food wine. Deep black lam with black reflections and almandine rim. The bouquet is rich, with lively cherry fruit supported by mentholated acidity and sweetish candied accents. Gives an impression of considerable ripeness, and is also quite young. On the palate it's ample, and rich, with sweet cherry plum fruit supported by moderately intense acidity, and by tannins that have brambly greenish accents and flow into a decidedly bitter brambly finish. The fruit is surprisingly ripe considering the vintage, though the greenish cast of the tannins is more in keeping with 2005, and this makes me wonder if some 2003 was added in the cellar (a legal practice called a taglio migliorativo). It will drink well with grilled meats, though I would give the tannins a year to fold in. Deep black lam with black reflections and almandine rim. The bouquet is intense, with dusky red cherry fruit supported by greenish accents, cedar, spice, and a fair amount of alcohol. On the palate it's full and rich, with powerful cherry fruit supported by bright berry fruit acidity and smooth sweet tannins that flow into a long clean berry fruit finish. Quick to write but quite harmonious, and also displays considerable depth and finesse. It's barely ready now, and will age well for many years. Worth seeking out. Deep black almandine with black reflections and almandine rim. The bouquet is muted, with very little emerging from the glass. On the palate it's ample and soft, with cherry plum fruit supported by (very) moderate acidity and smooth sweet tannins. Considering the vintage, which was cool and wet, the degree of ripeness, far into plum, is a bit of a surprise. I would have liked greater depth and more acidity, and while the former might have been difficult the vintage should have provided ample acidity. Much more than I found here. Deep black almandine with black rim. The bouquet is fairly intense, with cherry supported by greenish accents and some spice and also by a degree of sweetness. On the palate it's a bit thinner than I expected, though this is also youth: the fruit is fairly bright berry fruit supported by greenish acidity and by very dry cedary tannins that dry the tongue and flow into a long warm dry finish. With time the tannins will fold in, and if they do completely it will age nicely because it's one of the more acidic 2004 Riserve I've tasted, becoming lacy and ethereal. But that's for the future, and at present it's really not ready. If you like this rather traditional style and have patience, it will be worth waiting for. Deep black almandine with black reflections and almandine rim. The bouquet is greenish, with cedar and some penetrating chemical accents also from wood. Not much fruit, and one has the impression that the wine was more oaked to make up for vintage deficiencies. On the palate it's ample and quite smooth, with dusky berry fruit supported by bitterness more than acidity, and by very smooth sweet tannins that flow into a rather bitter savory finish. Deep black almandine with black reflections and almandine rim. The bouquet is moderately intense, with tart berry fruit supported by some greenish cedar and clean spice. Very young, but harmonious and is coming together. On the palate it's bright, with lively cherry fruit supported by fairly bright acidity and tannins that are warm and dry, flowing into a dry finish; it needs another year at least to come together, but is pleasant in a fairly traditional, not overripe key, and will drink very well with grilled meats or roasts in the short term, and age nicely for a decade or more. Deep black almandine with black reflections and almandine rim. The bouquet is fairly rich, with balsamic accents and warmth mingled with sweetish cherry fruit and some menthol; it gives an impression of softness. On the palate it's ample and fairly soft, with moderately intense balsamic cherry fruit supported by clean balsamic acidity and by very smooth sweet tannins that flow into a warm balsamic cherry finish. It's pleasant in a softer traditional key, which is an odd combination, but one that also works fairly well. If you like the style, you will enjoy it. Deep black lam with black reflections and almandine rim. The bouquet is muted, though swishing brings up some greenish mentholated notes and spice. Not much fruit, but it's still developing. On the palate it's ample and soft, with moderately intense cherry plum fruit supported by smooth soft tannins and moderate acidity. I'd have liked greater depth and verve to it. Deep almandine with black reflections and almandine rim. The bouquet is somewhat overripe, with sweet cherry fruit supported by some greenish accents; it's also still developing and has a ways to go. On the palate it's richer than I expected from the nose, with bright cherry fruit supported by graceful berry fruit acidity and tannins that are fairly smooth, and flow into a bright fairly tannic finish that's also rather dry. It needs a year to get its bearings, and will be graceful in a willowy, not too powerful key. But I do think it will display pleasing finesse with time. Black almandine with black reflections and almandine rim. The bouquet is muted, with some berry fruit and greenish accents. Ample and very soft on palate, with delicate cherry fruit. Not overripe, but not too much acidity and the tannins are smooth and retiring. Black almandine with black reflections. Oaky nose with a fair amount of cedar and some spice mingled with sweetness; not much fruit. On the palate it's ample and soft, with moderately intense cherry fruit supported by fairly sweet acidity and smooth sweet tannins that flow into a clean soft finish. I'd have liked greater depth, and brighter acidity. Black almandine with black reflections and almandine rim. The bouquet is fairly intense, with cedar and some greenish accents mingled with berry fruit and some spice. On the palate it's ample and soft, with fairly rich cherry fruit supported by moderate berry fruit acidity, and by tannins that are quite smooth and ripe, and flow into a clean fairly bright berry fruit finish. Pleasant in a fairly international key, and if you like the style you will enjoy it; I would give the nose a year to come together, because it's still developing, and expect it to age well for 8-10 years. Deep pyrope with black reflections. Muted nose, swishing brings up some mentholated berry fruit and slight cedar with underlying spice. On the palate it's ample, and soft, with cherry and forest berry fruit supported by delicate acidity and by smooth sweet tannins that flow into a fairly sweet finish. Graceful in a sweetish middle of the road key, though the nose needs a year to catch up with the palate. Deep black lam with black reflections and almandine rim. The bouquet is muted, with some cedar and slight berry fruit and hints of sweetness, it's closed, though more swishing brings up some berry fruit. On the palate it's ample and quite soft, with moderately intense red berry fruit supported by sweet citric acidity and by smooth sweet tannins that are rather evanescent and fade into a lemony finish. It is the child of a weak vintage, but is weak itself, and I would have liked more acidity and more life. The Italian that comes to mind is manca polpa, not enough flesh. Almandine with brownish black reflections and almandine nose. The bouquet is warm and balsamic with some cedar and sweetish accents. Not much fruit. The palate reflects the nose, and it is quite soft, with moderate berry fruit supported by moderate acidity and smooth sweet tannins. Too soft for me. Pale almandine with black reflections and almandine rim. Soft sweet bouquet with berry fruit and some mentholated spice, and slight pungency as well. On the palate it's ample and soft, with fairly rich cherry fruit supported by sweet smooth tannins, and by fairly bright acidity. Pleasant in a ripe but not overripe key, and will drink nicely in the short term with grilled or roasted meats, though I would have liked more backbone to the tannins, which are to the smooth end of the spectrum. Lively almandine with black reflections and almandine rim. Medicinal nose with greenish accents and some cedar mingled with menthol, and some rather pungent cedar. Not much fruit. On the palate it's fairly rich, with cherry fruit supported by bright berry fruit acidity, and by tannins that are smooth and sweet, and flow into a clean rather bitter dry tannic finish. It's fairly direct in a middle of the road key, and needs another year for the nose and the tannins to develop, after which it will age well for a decade or more. Deep black almandine with black reflections. The bouquet is candied, with sweet cherry fruit supported by jammy accents and some menthol, also a fair amount of alcohol. On the palate it's rich and soft, with cherry plum fruit supported by moderate acidity and smooth tannins that simply abdicate their duties of support and direction, I would have liked more depth and more power, and also more direction. Almandine with black reflections and almandine rim. The bouquet is warm, and balsamic, with some cedary notes and moderate berry fruit acidity, but at present little fruit. Traditional in feel. On the palate it's ample and soft, with balsamic cherry fruit supported by slightly bitter balsamic acidity, and by smooth sweet tannins that are very ripe, and flow into a soft balsamic finish. It's traditional in flavor cast, and very soft, and if you like the combination and the style you will enjoy it. Because of its softness it is more a wine to be drunk by the glass than a wine to go with foods. Deep black almandine with black reflections and almandine rim. The bouquet is powerful, and rather pungent, with cut leaf tobacco and greenish accents mingled with savory spice and sea salt. Quite traditional, and if you like the style pleasant to sniff. On the palate it's full, and softer than I had expected from the nose, with ample cherry fruit supported by sweetness that confers roundness, and by deft balsamic acidity, while the tannins are ripe and quite smooth. Pleasant in a ripe soft traditional key, and if you like the style you will enjoy it. Deep black almandine with black reflections and almandine rim. The bouquet is fairly sweet, and slightly balsamic, with cherry fruit supported by dusky graphite shaving bitterness and some spice. On the palate it's fairly rich, though a bit flat, with moderate berry fruit supported by slight acidity and by tannins that have dusky graphite shaving burr, and flow into a fairly bitter finish. It's settled, and I would have liked more acidity; as it stands it lacks verve. Almandine with black reflections and almandine rim. The bouquet is fairly rich, with mentholated berry fruit supported by sweetness and some bitter smoky accents, with hints of anise seed as well. On the palate it's ample, and soft, with delicate sour cherry fruit supported by sour berry fruit acidity that is fairly warm and slightly balsamic, and by smooth sweet tannins that flow into a long sour berry fruit finish. Pleasant in a soft, graceful, traditional key, and if you like the style you will enjoy it; I would expect it to age nicely for 8-10 years, becoming lacy with time. A problem? I would have liked more upstanding tannins, though those present are quite ripe and quite smooth. Black almandine with black reflections and almandine rim. The bouquet is muted, though swishing brings up candied cherry fruit mingled with berry fruit jam and some mentholated accents. Needs time. On the palate it's ample and fairly sweet, with cherry fruit supported by clean sour berry fruit acidity and by smooth sweet tannins that flow into a clean bright berry fruit finish. It's middle of the road in key, and I'd have liked slightly brighter acidity, but it will develop nicely over the next couple of years -- give it the time -- and then age well for a decade or more. Deep black almandine with black reflections and almandine rim. The bouquet is fairly rich, with cherry fruit supported by clean bright berry fruit acidity and some greenish accents that gain depth from berry fruit acidity and hints of sweetness that aren't quite brown sugar but in that direction. On the palate it's fairly rich, with sweet cherry plum fruit supported by smooth sweet tannins and only moderate acidity that flow into a clean fresh berry fruit finish. It's much riper than I would have expected a 2005 to be, and more in keeping with a much hotter vintage. If you like the style, which is ample, ripe, smooth, dusky, and soft, you will enjoy it, but you have to like the style. Deep black almandine with black reflections and almandine rim. The bouquet is moderately intense, with balsamic accents and spice mingled with sour cherry fruit. Pleasant in a traditional key. On the palate it's ample, with fairly rich sour cherry fruit supported by moderate acidity, and by tannins that are flatter and blockier than I might have hoped; it has a flatness to it that makes it feel blocky, while slight graphite shaving bitterness is also distracting. In short, more interesting on nose than palate. Lively black almandine with black reflections. The bouquet is intense, with jammy greenish accents and spice mingled with menthol and a fair amount of sweetness, also some prune. Seems very ripe. On the palate it's ample and very soft, with cherry plum fruit supported by moderately intense cherry acidity, and by tannins that have a slight peppery burr and flow into a warm peppery finish. Big, soft, and quite ripe, and because of its softness and relative sweetness better suited to being drunk by the glass than with foods, other than (perhaps) spicy stews. Almandine with black reflections and lam rim. The bouquet is moderately intense and still developing, with some berry fruit accents mingled with balsam and some underlying cedar. Not much acidity on the nose, though there is some menthol, while the fruit is berry fruit, with some dried floral accents. On the palate it's ample, and fairly rich, with deft cherry fruit supported by clean sour berry fruit acidity and by very smooth sweet tannins that flow into a clean bright berry fruit finish. Pleasant, though the nose needs another year to catch up with the palate, and it will be graceful in a rather willowy key. I would expect it to age 10 years at least, and it's worth seeking out if you like wines that privilege finesse over raw power. Deep black almadine with black reflections and almandine rim. The bouquet is intense, and frankly balsamic, with balsamic notes and greenish balsamic acidity supported by savory sea salt and some spice. Not much fruit. On the palate it's medium bodied, with fairly bright sour cherry fruit supported by moderate acidity and languid tannins that flow into a clean rather languid finish. It's clearly the child of a cooler vintage, but displays a certain brambly grace, and is pleasant to drink. You have to like the style, however. Impenetrable pyrope with black reflections and dusky cherry rim. The bouquet is powerful and sweet, with jammy prune accents and some menthol supported by abundant alcohol. Big and soft. On the palate it's ample, with rich cherry 0plum fruit supported by brighter than expected berry fruit acidity -- prune and cherry -- and by tannins that are ample, and soft, but do have a peppery burr that flows into a long prune finish. If you like the style it is quite drinkable, more by the glass than with foods, but you have to like the style. If you prefer brighter, tighter wines it won't work for you. Deep black almandine with black reflections and almandine rim. The bouquet is muted, though swishing brings up some mentholated berry fruit and hints of cedar. Still developing. On the palate it's fairly bright, with lively sour cherry fruit supported by berry fruit acidity and by tannins that have a warm cedary burr and flow into a clean fairly bright warm tannic finish. It's a bit young, and needs another year for the nose to develop and the tannins to smooth in. This said, it's delicate and fairly light; I think it might become lacy with time but if you prefer wines with greater body and power it won't work as well for you. Deep black lam with black reflections and almandine rim. The bouquet is moderately intense with leathery accents and some spice, but the overall impression is one of closedness. On the palate it's ample, with moderate berry fruit supported by some acidity, and by tannins that are very smooth and quite soft. I'd have liked greater intensity and verve; while it's not rally settled it's headed in that direction. Almandine with black reflections and brownish almandine rim. The bouquet is intense, and decidedly balsamic with some greenish cedar as well; it's clearly up in the air. On the palate it's ample and fairly soft, with moderately intense cherry fruit supported by balsamic acidity and smooth sweet tannins that flow into a fairly soft finish. I'd have liked more depth and backbone; it's a bit settled, rather like a person with a curved spine. Black almandine with black reflections and lam rim. The bouquet is muted, with some candied cherry fruit and slight balsamic accents, but not much else. On the palate it's ample and soft, with moderately rich cherry fruit supported by balsamic acidity and balsam laced tannins that carry into a very warm finish. It's still quite young, and the nose needs a couple of years to develop, within the style it is harmonious, but I found myself wishing the tannins had more verve. It's not quite flat, but not really lively either. Deep black lam with black reflections. The bouquet is smoky and bitter with spicy savory accents, and leaf tobacco, but not much in the way of fruit. On the palate it's ample, with fairly rich berry fruit supported by moderate acidity and smooth sweet tannins that lead into a warm tannic finish. It's very young, and the nose has yet to come together completely; it is at present direct, but will drink well with grilled meats, roasts, or stews, and there is acidity sufficient for it to age, at which point it may do interesting things. In other words, a wine I would give time to. Deep black lam with black reflections. Candied nose, with candied cherry and some dusky notes mingled with alcohol. Not much acidity. On the palate it's ample and quite soft, with cherry plum fruit supported by just enough mineral acidity to provide steerage (now), and by smooth sweet tannins that flow into a brief finish with dome hazelnut accents. Big, and smooth, but I found it lacking in direction. Deep black almandine with black reflections and almandine rim. The bouquet is moderately intense, with balsamic notes mingled with sweetness and spice, and some, but not much cherry and forest berry fruit. On the palate it's ample, with soft sour cherry fruit that's more intense than I expected, supported by fairly bright berry fruit acidity and by smooth sweet tannins that flow into a clean sour cherry finish with tannic underpinning. On the palate it's graceful, in a rather traditional key, with bright acidity that keeps it on its toes and makes it interesting, and I would give it a year for the nose to catch up. Deep brownish almandine with black reflections and almandine rim. The bouquet is greenish, with balsam and cedar mingled with slight barnyard tang, and some menthol as well. On the palate it's ample and soft, with moderate berry fruit supported by languid berry fruit acidity and by smooth sweet tannins that flow into a quick finish. Lively almandine with black reflections and lam in the rim. The bouquet is fairly intense, with sour cherry fruit supported by dusky greenish acidity and by pleasant spice. Still developing, and needs time. On the palate it's ample, and softer than I had expected from the nose, with moderately intense rather flat cherry fruit supported by some berry fruit acidity, and by tannins that are ample and cedar laced, flow into a warm tannic finish. It's lacking in verve and oomph, and I would have liked more and brighter acidity and fruit. Deep almandine with black reflections and brownish almandine rim. The bouquet is dusky with balsamic accents and savory spice supported by warmth and some dried flowers. Fairly traditional in feel. On the palate it's ample, with fairly rich sour cherry fruit supported by clean slightly balsamic acidity and by smooth tannins that have a warm balsamic underpinning and flow into a warm clean finish. It's fairly direct, and also very young; there's something stumbling to it however, and I wonder how it will age. Deep black almandine with black reflections and almandine rim. The bouquet is fairly rich, in a cool weather key, with brambles and slight balsam mingled with underbrush and some underlying spice and berry fruit. But it's mostly bramble and coolness at the outset, while as it opens menthol also emerges. On the palate it's ample, and soft, with rich cherry plum fruit supported by smooth sweet tannins and moderate acidity that flow into a clean rather sour berry fruit finish. It's very much the child of a cool vintage, though there is a richness to the fruit that makes me wonder if they added a little of something richer (a legal practice). To be quite frank, it's softness is such that it will almost be better by the glass than with foods. I would have liked more acidity and aggressiveness on the palate, which is a bit too settled. Deep black almandine with black reflections and lam rim. The bouquet is intense, with considerable balsamic notes mingled with sea salt and some spice, and also hops (of the sort used in making beer) with underlying savory accents. A bit unusual, and this is likely a factor of youth. On the palate it's fairly rich, and oddly sweet, with powerful sunny cherry fruit supported by citric acidity and smooth sweet tannins that flow into a fairly warm soft finish. Unusual, and not what one would expect from a Brunello in a normal vintage, but it does show what can happen when it rains for much of the summer and people do their best to correct matters in the cellars. Lively almandine with black reflections and almandine rim. The bouquet is muted, in a greenish key, with spice and some underbrush but not much in the way of fruit. On the palate it's ample and again rather green, with greenish berry fruit supported by brambly acidity and lively greenish tannins that flow into a brambly finish. One can almost feel the rain coming down, but it does display a pleasing grace and considerable vitality. It's not a wine to consider if you want something smooth, or rich, or powerful, but it dose display finesse and is very true to the vintage. I rather enjoyed it, and if you're a thoughtful wine lover -- it's not immediate -- you will find that it has much to say. Deep almandine with black reflections and almandine rim. The bouquet is fairly rich, with greenish cut tobacco and some acidity mingled with spice, and slight sweetness. On the palate it's ample and fairly soft, with slight sour cherry fruit supported by moderately intense berry fruit acidity, and by tannins that are slightly blocky, and this is a factor of youth. It needs a year to get its bearings and come together, at which point it will be graceful in a lesser vintage key. At present it brings to mind a pretty girl in a frazzled bathrobe, and that is what I record, though I expect the picture will be different in another year.